NEW: Democratic senator wants to make sure bill "delivers the bang for the buck"
WASHINGTON (CNN) -- Democrats admit it's going to be a tough fight to get President Obama's economic stimulus plan passed with bipartisan support, but they are optimistic it can be done. 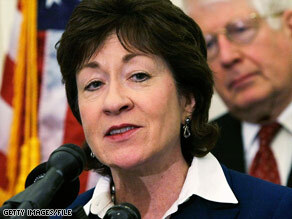 Sen. Susan Collins, R-Maine, says she wants to work on changes to the bill to attract moderate Republicans. On Thursday night, Senate Majority Leader Harry Reid, D-Nevada, said it is going to be a "long, hard slog" with "late nights" after the $900 billion bill comes to the Senate floor Monday night. "It is up to us how long this takes," Reid added. "We hope we can work things out." The president hopes to have the plan passed by Congress and on his desk for signing by mid-February. Vice President Joe Biden said he is optimistic the Senate version will be passed. "When you have two branches of government, three separate entities, working on something, I'm not sure it could have gotten at this stage much better than it is," Biden told CNBC's John Harwood on Thursday. "It's good. I think you'll see it get better, and I also think you'll see Republicans voting for it." Politico.com's Martin Kady told CNN on Friday that he expects more Republicans will be "getting on board" with the president. "I wouldn't be surprised to see Obama do a little more outreach on the Senate side. Knock out a little bit of spending, add some more small-business tax cuts -- sweeteners to draw a couple more Republicans in," Kady said. "You'll probably see more Republicans getting on board, because Obama does not want this to be ... a straight-up partisan vote." Republicans aren't biting just yet. A dozen or so senators have already voiced their concerns over what they say is the lack of tax cuts and too much spending on programs that won't stimulate the economy. "Republicans have appreciated the president's outreach to present ideas, but we are too often met with this response: 'We won and therefore we are going to do it our way,' " Sen. John Kyl, R-Arizona, said Thursday. "I do think it is so important that we slow this bill down in order to do it right," Sen. Kay Bailey Hutchison, R-Texas, has said. In the Senate, Republicans will have more of a chance to do it their way, by offering amendments to the Democrats' bill. But it's not just Republicans who are unhappy. Some Democrats said there are too many proposals that do not relate to stimulating the economy. Sen. Ben Nelson, D-Nebraska, and Sen. Susan Collins, R-Maine, oppose the proposal in its current form and want to slash what they say is wasteful spending from the bill so moderate Republicans and conservative Democrats can vote for it. "I want to see the president succeed," Nelson said. "But in this situation I want to make sure the actual package delivers the bang for the buck that we're hoping it will." "I want to draft a whole new approach and I'm guided by the credo: Will it help turn the economy around? Will it create jobs?" Collins said. The senators complain the bill is bogged down with spending for programs that may be worthwhile, but that won't boost the economy in the short term. "I want to go through and sort out and scrub it to see those things that are only marginally job creation or job preservation at best and not include those in this bill," Nelson said. "Maybe we can get more bipartisan support if we do something of that sort." The urgency to get the president's plan passed in the Senate has Democratic groups pressuring several moderate Republicans with new ads in hopes of making next week's vote a more bipartisan one. On Thursday, several groups -- including Americans United for Change, MoveOn.org Political Action, the Service Employees International Union and the American Federation of State, County and Municipal Employees -- announced they will be running ads in four states targeting five GOP senators: Collins, Olympia Snowe of Maine, Judd Gregg of New Hampshire, Lisa Murkowski of Alaska and Chuck Grassley of Iowa. The Senate has already made some changes in its version of the bill, which is approaching $900 billion. The Senate Finance Committee added about $70 billion to fix the Alternative Minimum Tax, which was intended to place a tax on the wealthy, but now hits many middle-class families. The Senate bill adds direct money for seniors, with a plan to send $300 checks to Social Security recipients and disabled veterans. Smaller changes in the Senate version include $108 million to extend worker retraining programs and a provision to block any taxes on the first $2,400 of unemployment benefits. Aides say housing relief is also going to be a big issue for some Republican senators. The main concerns are similar to those of their House counterparts: They want more tax cuts and less spending. "We look forward to offering amendments to improve this critical legislation and move it back to the package President Obama originally proposed -- 40 percent tax relief, no wasteful spending and a bipartisan approach," said Senate Minority Leader Mitch McConnell of Kentucky. Obama has made it clear that he's not willing to budge on some of the big-ticket items, like how the tax cuts are structured. The version passed in the House is two-thirds spending and one-third tax cuts. Much of the $550 billion in spending is divided among these areas: $142 billion for education, $111 billion for health care, $90 billion for infrastructure, $72 billion for aid and benefits, $54 billion for energy, $16 billion for science and technology, and $13 billion for housing. CNN's Jim Acosta, Dana Bash, Lisa Desjardins, Gloria Borger, Ed Henry and Brianna Keilar contributed to this report.